gCaptain reports that Edison-Chouest is building another icebreaker (Anchor Handling Tug Supply (AHTS) ship), with an option for a second. Another gCaptain post appears to indicate that they are in fact building two. These vessels appear to be similar to the earlier M/V Aiviq. They will be Polar Class 3. Polar class 3 means “Year-round operation in second-year ice which may include multiyear ice inclusions.” It appears we might be seeing the emergence of a whole class of privately owned American medium icebeakers. Researching this, I found reference to two similar, if perhaps less capable, Class 4 icebreakers, both built in 1983 in Canada, as commercial AHTS vessels, one, CCGS Terry Fox, is now used by the Canadian Coast Guard, and her sister ship, Vladimir Ignatyuk, is now owned by Russia’s Murmansk Shipping Company and was chartered by the National Science Foundation to lead the break-in to McMurdo sound two seasons, during the Antarctic summers of 2011/12 and 2012/13. The Russian icebreaker Vladimir Ignatyuk breaking a path in the annual sea ice to McMurdo Station, Antarctica on January 26, 2012. So far I have seen no indication of official Coast Guard interest in filling the stated requirement for three medium icebreakers. These ships do not have the redundancy we would like in a our ships. But that could be fixed. Plus lower cost might allow a different kind of redundancy, assigning two ships to the task rather than only one, allowing an organic Coast Guard self rescue capability that the Commandant has pointed out is missing with our current very limited icebreaker fleet. If the cost of these is similar to that of the M/V Aiviq ($200M, 16,240 KW/21,760 HP), even after upgrades to meet Coast Guard requirements, e.g. flight deck, hangar, communications, etc., and additional overhead that are included in Coast Guard procurement cost, we should be able to build a medium Icebreaker of similar capability for a third the $1B cost of a heavy icebreaker. Is a medium icebreaker sufficient for our needs? 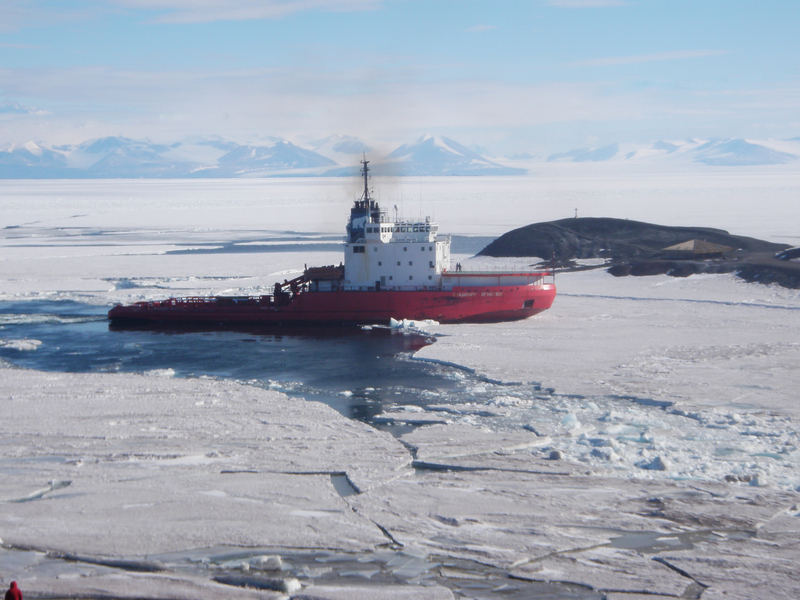 We already have a documented requirement for three medium icebreakers in addition to three heavy icebreakers compared with the current fleet of one each. In a Defense News interview the Commandant pointed out, “First of all, it’s heavy ice breaking capability. Last year the Polar Star had to rescue a medium ice breaker from China. Just before they arrived, the wind shifted and they were able to get out on their own. Clearly, [that] is no place for a medium ice breaker. It does require heavy ice-breaking capability.” While I would never suggest that a Heavy icebreaker is not desirable, in fact the MV Xue Long (Snow Dragon) is more ice strengthened cargo ship than icebreaker with a large hull (21,025 tons) and relatively weak engines (13,200 KW/17,694 HP) and would be considered by the Coast Guard a light polar breaker (less than 20,000 HP). Historically the Operation Deepfreeze break-in has been done most frequently by ships we would now classify as medium or light icebreakers. If you look at this chart, prepared by the Coast Guard, in 2013, of the 78 icebreakers of over 10,000 HP, operated by 17 countries, only eight of them were Heavy icebreakers (=>45,000 SHP). 34 were medium icebreakers of 20,000 to less than 45,000 HP, and 36 were smaller icebreakers of 10,000 to less than 20,000 HP. Interestingly, in addition to five heavy icebreakers, four medium, and two smaller icebreakers have managed to make it to the North Pole. Even if funding can be found for a new heavy icebreaker, by the time it is built, we will again have only one heavy icebreaker (unless Polar Sea is reactivated), because the Polar Star will almost certainly be out of service by the time it enters service. We really need to consider alternatives to give us the numbers we need in the not too distant future. Apparently there is agreement we need at least two more medium icebreakers in addition to USCGC Healy. Getting them into the budget looks a lot more do able than a $1B heavy icebreaker, and far, far easier than two Heavies. This entry was posted in icebreaker, Shipbuilding and tagged Arctic by Chuck Hill. Bookmark the permalink. I agree that the medium icebreakers would be more affordable but it seems possible that role can be provided for by the private sector in a lot of cases. The heavy icebreakers don’t seem to make economic sense for the private sector. what they should have done was plan ahead when they were developing the juniper class buoy tender and design them along the lines of the Mackinaw only heavier. How dose the Mackinaw compare to the Healy or Polar class other than size when it comes to ice breaking service? I’m not a great fan of USCG’s way of classifying icebreakers into “heavy”, “medium” and “light” classes based only on their propulsion power with no regard on the actual icebreaking performance of the vessel. A well-designed “medium” icebreaker can easily outperform a much more powerful “heavy” icebreaker with less sophisticated hull form even without going to extreme hull forms such as that of Sweden’s “Oden”. Furthermore, straight-line icebreaking performance alone does not really tell how “good” the icebreaker actually is – for example, there are icebreakers currently in service that have practically no turning ability in difficult ice conditions due to their propulsion and rudder arrangement. I still can’t believe the USCG can spend up to $1 billion on a single heavy icebreaker. I mean, shouldn’t a bigger vessel be cheaper than two smaller ones with half the displacement and power? Furthermore, DSME (South Korea) is currently building high ice class LNG carriers that can operate in nearly 7 ft thick ice independently without icebreaker assistance. Each ship has three 15,000 kW Azipod units and six medium-speed dual fuel generating sets. They are nearly 1000 ft long and over 160 ft wide. The cost? A bit over $300 million. Even with a hefty import tax, I can’t imagine the propulsion system – the most complicated and thus the most expensive part of the icebreaker – would cost more than $150 million when shipped to USCG’s doorstep. Tups, Thanks. Looks like an interesting ship. I managed to blow up the plans for a better look. Looks very versatile. Moon pool, lots of cargo space. Six ship’s boats, Integrated diesel electric power plant. Most surprising to me was that there is a hangar for two helicopters under the flight deck on the bow. I don’t like the fact that all the generators are in a single fire zone. At least they divided the engine spaces into port and starboard engine rooms. The lounge. should be popular when the seas are calm, when it gets rough not so much. Do you know what the horsepower will be? I also kind of like the way they appear to be crowd sourcing input on the design. Chuck, in general, it’s a typical modern scientific research vessel with resupply capability. Regarding the engine room, the generating sets are typically placed in a single compartment unless there is a specific requirement for redundancy (“safe return to port” rules, high dynamic positioning (DP) class…). Still, it’s something that can usually be done quite easily as long as it’s done from the beginning. I don’t recognize the generating sets, so I don’t know about the power, but I would assume the installed power is somewhere around 15,000 kW and the propulsion power around 10-12 MW. It’s just a guess, but the ship has 32 cylinders and those engines quite probably have a cylinder output of 450-500 kW. Crowd sourcing works quite well when you’re asking scientist what kind of labs they need and how they use them. In that way, you can avoid stupid design mistakes such as putting a lab in a place where it can’t be used for the intended purpose. However, you have to be careful. If you just ask everyone what they want, you’ll probably get such a long wish list that it’s impossible to fit everything on the vessel. Of course, you could do it in a more sophisticated way, such as ask them to rank the features every group of users needs and then weigh the results based on how much they are contributing to the vessel. There’s also a new icebreaker for Russian oil fields on page 18. The 2013 issue has an article about modern polar icebreakers. The government simply can NOT compete with these Cajun boat builders when it comes to building specialized small ships.. They have built two ice ships for National Science Foundation. leesea, while I have only seen a few American offshore vessels in real life, I have seen plenty of photographs and video footage of ships built for the oil fields in the Gulf of Mexico online. If you compare these vessels to the ones used for similar tasks in the North Sea, what I said in my previous message becomes pretty obvious. Anyway, my point is that you can’t make a good icebreaker if your manufacturing capability is limited to simple hull forms. Every deviation from the optimal solution adds to the ice resistance, meaning that you need to add more power to achieve the required performance, which in turn adds to the ship’s lightship weight (heavier engines) as well as deadweight (bigger fuel tanks). In order to accommodate both of these, you’ll have to increase your main dimensions, which affects to your ice resistance as well. It’s not an endless positive feedback loop, but you’ll get the point. I’m not saying all shipyards in the region are the same, but most of them appear to be building quite simple hulls. These boats may be for sale anyone interested contact me for additional information and POC. “Edison Chouest Offshore has already begun cutting the workforce at its LAShip operation in Houma, Senior Vice President Roger White confirmed in a telephone interview, due to cancellation of a Royal Dutch Shell order for two icebreakers that were being built at the Houma shipyard. One LAShip employee laid off last week confirmed that he lost his job and is moving back to a different state, but did not wish to be identified. Could it be that Edison Chouest is not going to build the icebreakers now that there’s no market for them. The US might get a good deal if they are willing to work out the details.